More than sixty blocos will take place in Rio de Janeiro’s streets today, as Carnival celebrations enter their fourth day in the city. RIO DE JANEIRO, BRAZIL – Sixty-six official blocos are set to parade through the streets today, Monday, February 27th, attracting millions to the fourth consecutive day of the 2017 Carnival celebrations in Rio de Janeiro. Bloco Sargento Pimenta on the Aterro do Flamengo in 2016, photo by Tânia Rêgo/Agência Brasil. The street parties kicked off from as early as 7AM and are set to continue until midnight, with numerous unofficial blocos also taking place throughout the city. 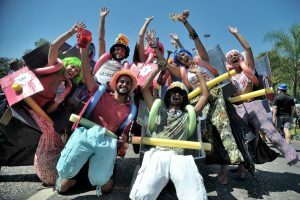 Twelve official blocos started before noon in regions across the city, including popular Beatles-themed bloco Sargento Pimenta in Flamengo and Bloco Afroreggae in Centro, both started to gather at 8AM (performance starts at 10AM). For those looking for a later start, Carvalho em Pé began at 10AM in Humaitá and will parade until 4PM. The majority of the official blocos take place this afternoon, with 48 scheduled to begin after midday and carrying on late into the evening. Monday afternoon’s blocos offer a range of music, from traditional samba to pop-rock and Afro-Brazilian styles. A further six blocos will take place from 6PM, in the Zona Norte and Zona Oeste (North and West Zones). Among the popular blocos happening today are Bloco da Eclectica in Centro from 3:30 PM, New Kids on the Bloco in Circo Voador from 5PM and Noites do Norte in Leme from 6PM. Bloco das Tubas will also take place in Santa Teresa from 8PM, and Monobloco will perform at Fundição Progresso from 10PM. However for those needing a rest today, there will be yet more blocos and parties happening throughout the city tomorrow, Tuesday, February 28th, on the final day of official Carnival celebrations.